has been managed by the Port Authority of New York & New Jersey (PANYNJ) since the lane opened on December 18, 1970. According to the PANYNJ, the XBL serves more than 1,800 buses per day carrying more than 62,000 passengers to New York City. When the XBL opened in 1970 it was the first contra-flow bus lane on a freeway in the United States. NJ Transit operates a Park & Ride facility located under the Route 495 Viaduct. NJ Transit bus #320 serves the lot and provides service to Manhattan. 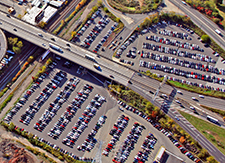 Access to the lot is provided via Route 3 westbound, Route 495 and Paterson Plank Road. The bus service and Park & Ride facility will remain open during construction. The Route 495 Viaduct (Structure No. 0917-150) is a nine-span bridge that was constructed in 1938. 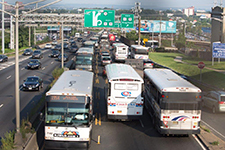 The Route 495 Bridge carries traffic on Route 495 over the NJ Transit Park and Ride, the NYS&W and Conrail rail lines, as well as Route 1&9, Paterson Plank Road and Liberty Avenue. The bridge is rated as structurally deficient and functionally obsolete. The Viaduct was constructed with 3 lanes in each direction, and one lane on each of the westbound ramps. Between 1955 and 1985, the bridge was widened, and now carries 4 lanes in each direction. Throughout the life of the structure, it has been re-decked, rehabilitated multiple times. However, there have never been any significant modifications or repairs to either of the attached ramps. 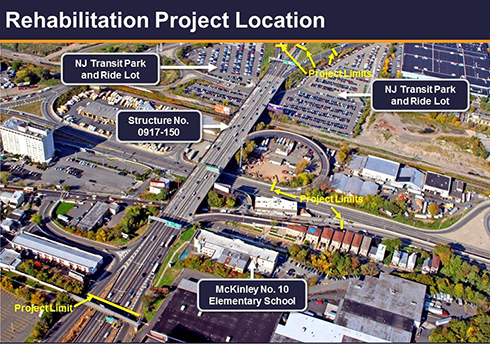 The project will rehabilitate the structure by replacing the mainline deck; the decks of the ramps to Route 1&9 Southbound and Paterson Plank Road Northbound; and repair/replace deteriorated steel. Additional improvements include adding new lighting, drainage system, barrier and guide rail. The rehabilitation of this bridge is expected to extend its service life by at least 75 years. The project limits are shown below.